COSTA MESA, Calif. — The Los Angeles Chargers announced on Wednesday they will not exercise the 2019 option on the contract of DT Corey Liuget, the longest-tenured player on defense. The move means Liuget will become a free agent in March. However, Chargers GM Tom Telesco said it remains a possibility for Liuget to return to the Chargers in free agency. Liuget joins fellow defensive lineman Brandon Mebane, Darius Philon and Damion Square as Chargers set to hit free agency in March. “While we did not exercise the 2019 option in Corey’s contract and he will now become a free agent on March 13, the door is certainly not closed for a possible return in the future,” Telesco said in a statement. Selected in the first round of the 2011 draft by the Charges, Liuget was due to make $8 million in 2019, including a $4 million roster bonus due on the third day of the new league year in March. 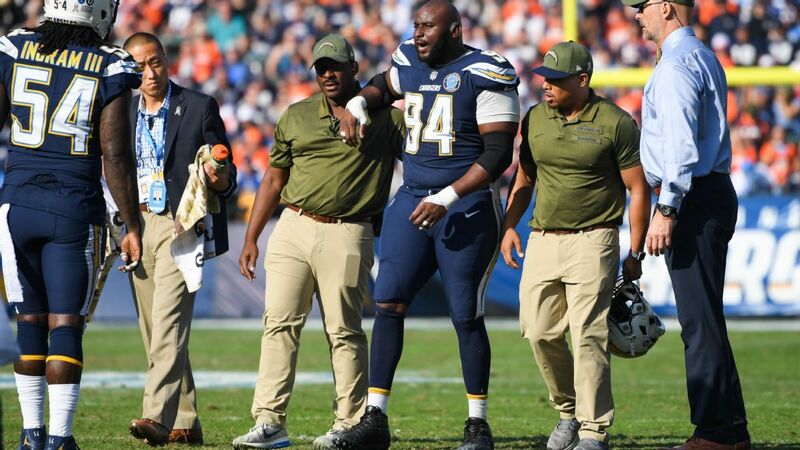 After serving a four-game suspension to start the 2018 season for violating the league’s policy on performance-enhancing drugs, Liguet returned to the field in Week 5 and played well defensively for the Chargers, but suffered a season-ending torn right quad in a Week 11 loss against the Denver Broncos. Liuget totaled 14 combined tackles and 1.5 sacks in six games played, including three starts. Selected No. 18 overall by the Chargers in the 2011 draft out of Illinois, the 28-year-old Liuget recorded 274 combined tackles and 24 sacks in eight NFL seasons. Liuget had surgery in December to repair his torn quad in New York, and returned there to rehab. He hopes to be on the road to recovery by March and available to participate in some aspects of offseason work. A roller coaster season for Liuget ended on a high note when the Chargers nominated the defensive tackle for the NFL’s Walter Payton Man of the Year Award, presented to a player from each team for their commitment to community service work. “For me, it’s everything because he’s a guy that I idolized growing up, someone that I looked up to,” Liuget said about Payton. The honor for Liuget was unusual because of his suspension for violating the PED policy. Liuget’s suing former trainer Ian Danney for $15 million in damages due to lost wages, pain and suffering he believes were caused by his positive test. “To know that the team looked at me as a guy that’s always doing something good in the community and they can count on me to go and represent them as a good, outstanding person in the community is important,” Liuget said. A South Florida native, last year Liuget met and worked out with the Marjory Stoneman Douglas football team to honor former assistant coach Aaron Feis, one of the 17 victims of the Parkland shooting. Liuget donated $10,000 to the team and created the Coach Aaron Feis Scholarship Fund to help support members of the team. The scholarship will be awarded to a graduating member of the team who exhibits characteristics representative of who Feis was and the traits he valued.